With a roar of nitro thunder, season champions in the NHRA® Harley-Davidson® Drag Racing Series were crowned November 8 at the 2015 NHRA Lucas Oil Drag Racing Series Short Line Express Gambler Shootout in Las Vegas. 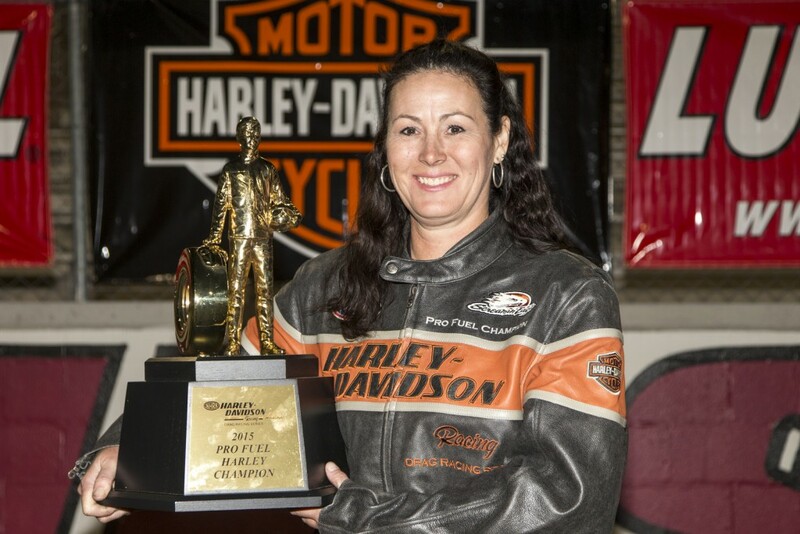 Dreamchaser Racing/Deschutes Brewery rider Janette Thornley snatched the Pro Fuel Harley title with a clutch performance at the finals. Thornley, of Statesville, N.C., started the weekend trailing class leader Dennis Fisher by five points. Thornley won in the first round of eliminations and clinched the title when Fisher lost his first-round match. Thornley advanced to the final round of eliminations before losing to defending Pro Fuel champion Johnny Vickers. Thornley, who was awarded an NHRA Wally trophy for her championship, notched four event wins during the season and scored 623 points. Fisher finished the season in second place with 595 points, followed by David Larson with 315 points.